The Main Event was held in Duesseldorf, on the banks of the River Rhine, once the heart of the German industrial revolution, and today a wealthy centre of the trade and service industries. The program began with a performance by Shin-Rok, a dynamic second generation band, whose music wonderfully prepared the minds and hearts of the audience. The hall was full to capacity by the time that Mr. Hyun Jin Moon took to the stage to deliver the Founder’s Address. His bright and dynamic delivery held the attention of the whole audience. He introduced the words of the speech as the essence of the heart and thought of his parents and, as his voice rose and fell full of expression and passion, he carried this heart to all present. The next day after morning devotions Hyun Jin spoke passionately for over two hours. Throughout the speech he was actively in search of close relationship and interaction with his audience. His focus and expectation rested very much on the second generation, especially on the Special Task Force leaders. He spoke of God’s expectation that the second generation develop faith expressed as action, reach out as pioneers, and build a sense of ownership. As leaders they can channel their energies to move young people towards the ideal world of love and peace. Hyun Jin also implored the older generation to keep a young spirit and to be willing to walk the pioneer path. At one point he addressed a lady in her 80s, reminding her of her youth and assuring her that she would return to her prime when she enters the spirit world. We experienced Hyun Jin’s heart as he invested in leaders from dinnertime to beyond midnight and as he spread hope and confidence in the passing of our Founder's legacy through the generations. It was beautiful to see him standing with his new daughter-in-law, Ms. Jin Hwa Yoshida – Hurrah for three generations! 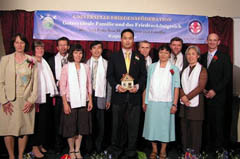 Down in Bavaria the people of Munich welcomed Mrs. Ji Yea Moon, whose heavenly charm won the hearts of Ambassadors for Peace, blessed families and their guests in the large hall of the Post Hotel. An inspiring program by a second generation musical group prepared the atmosphere. When Ji Yea stepped on stage the audience was immediately caught by her royal spirit; again and again they responded with enthusiastic applause. A number of guests expressed that through this event they could come to a deeper understanding of Rev. Moon’s mission and life. The brand new Marriott Courtyard Hotel in the very centre of Berlin was the venue for Mr. In Sup Pak, the husband of Sun Jin Moon, who delivered the Founder's message with a clear voice and much spirit. 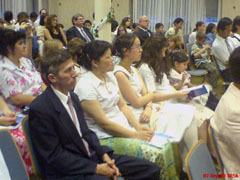 One third of the audience were Ambassadors for Peace, among them prominent leaders of the religious and ethnic communities of this cosmopolitan city. Dr. Amir Mohammed Herzog praised the unique effort of the family of Father and Mother Moon in traveling to 480 cities within 40 days, spreading the message of hope and peace. He called upon the adults to bequeath to youth the “torch of truth and liberty.” He is a good speaker; as a matter of fact, he used to be the campaign manager for Billy Graham, when the American evangelist was preaching in Germany. Mr. Shin Il Moon spoke in Giessen, where, despite his professed shyness, he kept the audience’s attention by bringing them to laughter on several occasions. He testified about his recent Blessing and his love for racing cars. We all felt that his frank nature corresponded well with German culture! The event began with a prayer offered by a healing community, sending waves of spiritual healing for peace between the Israelis and Palestinians. Professor Juergen Redhardt, an eminent theologian, praised the work of Father and Mother Moon in promoting mutual understanding between religions and expressed his hope that the UPF will flourish and accomplish its purpose to bring about world peace. This hope for peace was beautifully expressed in the musical talent of four young, second generation performers. We in the Giessen community feel this event has a deep significance in bringing God’s providence down to the city level and believe that our mission will flourish in a great way from now on! In the beautiful Taunus hills close by Frankfurt, the Neumuhle Workshop Centre, often visited by our Father and Mother Moon, became the venue in which to welcome their granddaughter, Ms. Shin Sook Moon. Half of the enthusiastic audience were second generation, who had taken a major part in the preparations for the event and in organizing some sightseeing earlier in the day. Ms. Moon delivered the speech with her whole heart and a strong spirit to loud applause from the audience. After the event she was so patient and with a lovely smile shook hands and posed for photographs. We won’t forget her! The whole program was a beautiful cooperation between the generations with two Emcees and entertainment from first and second generation. This time the appointment of Ambassadors for Peace included our youngest appointee, a 21-year-old student, who was so very inspired by the speaker’s courage and accomplishment. In Stuttgart we had a wonderful event. 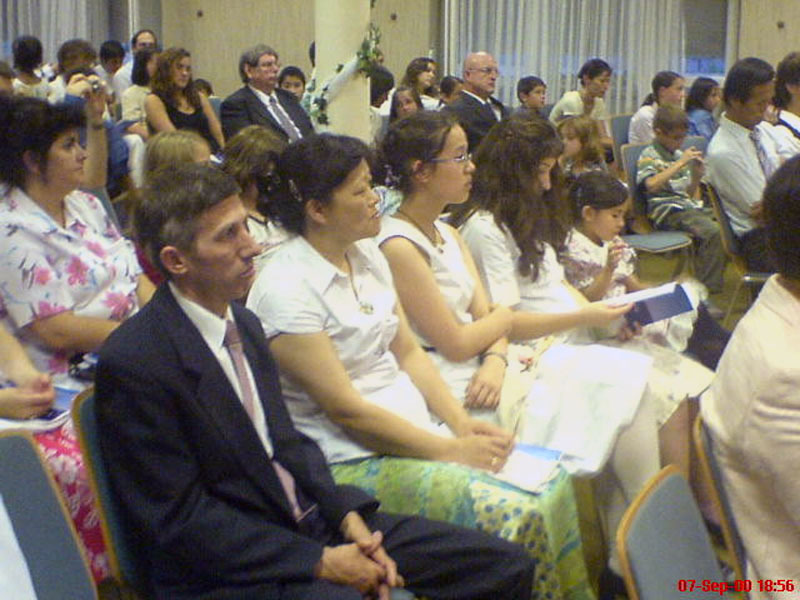 In the first row of the audience were six Ambassadors for Peace; over one hundred participants attended a full event. Mr. Shin Bok Hong did a great job, and all were deeply inspired from beginning to end. Then at the Bellabarba family's restaurant, we could enjoy a great meal and share and come to know each other better in a happy relaxed atmosphere. Afterwards we made a tour of the sights of the city and introduced the history and local projects of our movement. We are once again reminded of the heart to love humanity! 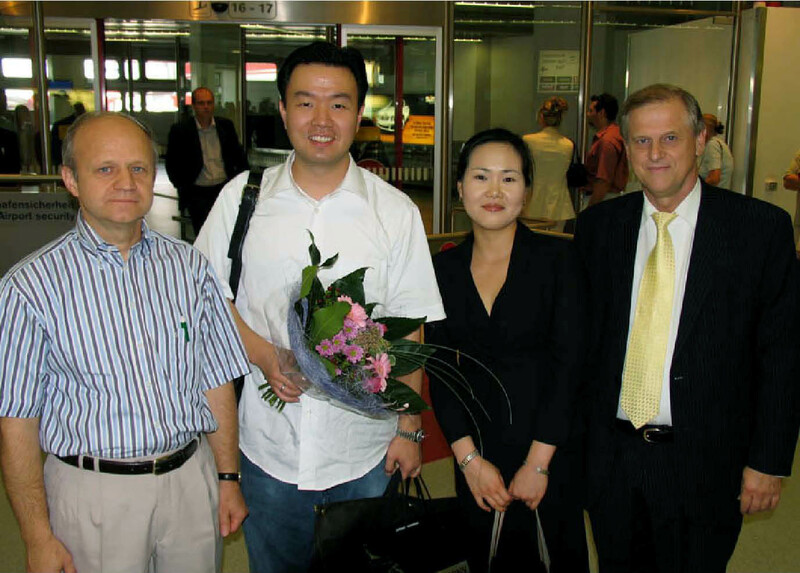 The “Meistersingerhalle” in Nuernberg was full to greet Mr. Hyung Jin Lee, husband of Shin Mi Moon. The youthful Sorak band raised the spirit and the video presentation gave our guests an intimate impression of the work of Father and Mother Moon in today’s world. Mr. Lee did a great job conveying the message of peace in English, while a PowerPoint displaying a German translation enabled everybody to follow and catch the depth of the message. Their appreciation was warmly expressed through frequent spontaneous clapping. Hamburg is the second largest city in Germany and the second largest port city in the European Union. The Madison Hotel located in the heart of the city near its harbor and the landmark Lutheran church of St. Michael was the venue for Mr. Hirotaka Otsuka to deliver his second speech in Europe. He read the speech in a concentrated and focused manner, and the audience listened attentively to the words of peace and true love. Our guest speaker took an active part in the whole event, watching the performance of our small children's choir, appointing a new Ambassador for Peace, and leading the three cheers at the end. Afterwards ten young people celebrated together with Mr. Otsuka in a traditional German restaurant on one of the oldest streets of Hamburg. During the day, there was an opportunity to do some sightseeing including taking a photograph in front of the statue of Martin Luther. The next day, we had morning prayer service together with Ms. Shiori Kunitoki, who had arrived from Bremen. Mr. Otsuka likes soccer very much and was well informed about the only Japanese player in the German Football League, Naohiro Takahara, a long-time player for the Hamburg Soccer Club. Ms. Kunitoki knew that the Beatles started their world career in the 1960s in the city of Hamburg, not so far from the location of the hotel. It was a doubly precious privilege to receive these young folks in such a very natural and personal way. The Golden Tulip Hotel in Bremen was beautifully arranged to welcome Ms. Shiori Kunitoki, wife of Mr. Shin Il Moon. Mrs. Hilke Ganz served as emcee while her husband Uli Ganz gave a PowerPoint presentation about UPF. Music performances were by our second generation brothers aged from 11 to 17. Ms. Kunitoki read the Founder's speech smoothly and with a high spirit. Ms. Yeon Sun Yu, newly blessed in marriage to Mr. Shin Bok Moon, grandson of Rev. and Mrs. Moon, arrived in Hannover minus her luggage. Heilis Weber, one of Hannover’s second generation youth, accompanied her in quick search for a beautiful outfit to wear during the program. Ambassador for Peace Dr. A. Wais spoke about the peace work of his organization, the African-Asian Student Organization of Göttingen. We were happy to be surrounded by an audience consisting of our friends and contacts, many of whom had changed appointments to attend. Ms. Yu entered with dignity and poise and represented Father and Mother Moon well. She read the Founder's speech in English, while the text in German was shown on the screen. She expressed such a happy and sincere spirit that everyone listened attentively, and when presented with flowers after her speech she responded by giving the young person a big hug, surprising everyone. Near the end of the program, our close friend and Ambassador for Peace, Dr. N. El Bassam (world famous for his work on water management in desert climates) slipped in unexpectedly. He had been at a family party but felt compelled to attend the speech and the remaining portion of our program. The key speaker at our event in Bonn was Ms. Jin Hwa Yoshida, recently blessed in marriage with Hyun Jin Moon’s son Shin Won. She did an outstanding job—from the moment of her arrival at Cologne-Bonn airport we felt as members of one family. She took the news calmly that the event had been moved from 7 pm up to 3 pm, with barely enough time for a look at the Rhine River promenade and eat lunch before she prepared for her public appearance. 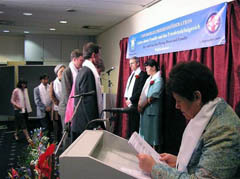 The Family Federation for World Peace hall was beautifully prepared with the help of Dutch members who felt the urge to come to Bonn. Here another chapter in the book of reconciliation and cooperation between former enemy nations was written. Dr. Edda Hanisch, an Ambassador for Peace, testified that she has followed the work of Rev. Moon since she noticed that he and his movement were the only ones during the Cold War who challenged communism on those points which are most essential. Having been in a communist prison in East Germany, she realized that Rev. Moon was the one to understand the intentions of that godless ideology. Ms. Yoshida impressed the audience with her gentle but confident reading of this message of peace. Three new Ambassadors for Peace were appointed, and as our event drew to a close some of our guests spontaneously decided to go right away to Dusseldorf to hear Mr. Hyun Jin Moon speak at the peace tour event there. Our FFWPU community in Detmold consists of a few very faithful Russian-German immigrants who organized our Peace Tour event very well. As the Emcee I was so delighted to welcome Mr. Young Jun Kim, whom I learned to know when we studied together at Unification Theological Seminary in New York. Not only did our speaker deliver the Founder’s Address very well, he also spoke personally to many participants over dinner and uplifted their hearts and spirits. We may have been the smallest event in Germany, but it was such a homelike, warm, family atmosphere. After the official event, there was a delicious buffet dinner for all participants, and one guest declared that he and his family were so encouraged that they would be happy to host our next peace meeting!